Ignoring jeers and cries of "Shame on you," a city commission on Tuesday denied landmark status to a building near the World Trade Center site that can now be demolished to make way for an Islamic community center and mosque. The Landmarks Preservation Commission said in voting 9-0 that the 152-year-old building isn't distinctive enough to qualify as a landmark. "This is not a building of special aesthetic character," said Commissioner Diana Chapin, echoing the remarks of her colleagues. The proposed mosque has emerged as a national political issue, with prominent Republicans from Alaska Gov. Sarah Palin to former House Speaker Newt Gingrich lining up against it. The Anti-Defamation League, the nation's most prominent Jewish civil rights group, also opposes it. Former New York City firefighter Tim Brown told CBS News Correspondent Jim Axelrod that he wants to know where the money for the mosque is coming from, believing the group's imam, Feisal Abdul Rauf, has ties with extremists. Former Rep. Rick Lazio, a Republican who is running for governor of New York, attended the commission meeting and criticized the group that is building the mosque, the Cordoba Initiative. "This is not about religion," Lazio said. "It's about this particular mosque called the Cordoba Mosque, it's about it being at ground zero, it's about it being spearheaded by an imam who has associated himself with radical Islamic causes and has made comments that should chill every single American, frankly." Lazio said the group's imam, Feisal Abdul Rauf, had refused to call the Palestinian group Hamas a terrorist organization. Rauf also had said in a "60 Minutes" interview televised shortly after 9/11 that "United States policies were an accessory to the crime that happened." Cordoba Initiative staff members did not immediately answer an e-mail seeking a response to Lazio's comments. Daisy Khan, executive director of the American Society for Muslim Advancement, told The Wall Street Journal in Tuesday's editions that the center's board will include members of other religions and will explore including an interfaith chapel at the center. "We want to repair the breach and be at the front and center to start the healing," said Khan, a partner in the building and the wife of the imam. 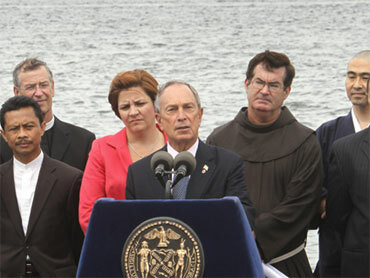 New York City Mayor Michael Bloomberg, speaking on Governor's Island against the backdrop of the Statue of Liberty, praised the commission's ruling. "This building is private property and the owners have a right to use the building as a house of worship," Bloomberg said. "The government has no right whatsoever to deny that right, and if it were tried the court would almost certainly strike it down as a violation of the U.S. constitution." Bloomberg said the firefighters and other first responders who died in the 9/11 attacks had done so to protect the constitution. To deny religious freedom to Muslims would play into the terrorists' hands, he said. "In rushing into those burning buildings, not one asked, 'What god do you pray to? What beliefs do you hold?"' Bloomberg said of the first responders. "We do not honor their lives by denying the very constitutional rights they died protecting." SoHo Properties, a partner in the project, purchased the property for nearly $5 million. Early plans call for a 13-story, $100 million Islamic center, of which the mosque would be a part. The property is two blocks north of the trade center site. Landmarks Commissioner Stephen Byrns said the building's proximity to the site, and the fact that it was struck by airplane debris during the attacks, does not qualify it as a landmark. "The debris field around ground zero was widespread, and one cannot designate hundreds of buildings on that criterion alone," Byrns said. SoHo Properties CEO Sharif El-Gamal said he was "deeply grateful to the landmarks commission and to its staff." He did not respond to a question about the timing of demolition and construction. Foes of the proposed mosque say it insults the memory of those who died on Sept. 11, 2001 at the hands of Muslim extremists. While landmarks commission members went over the existing building's architectural features like cornices and colonnades, some in the audience of about 60 at Pace University in lower Manhattan held signs telegraphing their opposition to the mosque. Linda Rivera's sign read, "Don't glorify murders of 3,000. No 9/11 victory mosque." 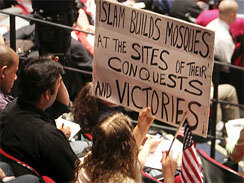 Left: Linda Rivera holds up a sign in opposition to the proposed mosque. She cried after the board's vote. "I lost 3,000 American brothers and sisters, including courageous policemen and firemen, and this is a betrayal," she said. Others said they supported the mosque. Zead Ramadan, president of the board of the New York chapter of the Council on American Islamic Relations, said Islam is "a religion of peace and justice." "The people here are trying to connect this vile attack on our nation to the religion Islam, though that exact act stands against everything that Islam stands for," he said. The Rev. Robert Chase, founding director of an interfaith group called Intersections, called the proposed mosque "a really positive example of how we can move forward from 9/11." The conservative public-interest law firm the American Center for Law and Justice, founded in 1990 by evangelist Pat Robertson, vowed to fight Tuesday's decision in court. ACLJ attorney Brett Joshpe said the group would file a petition in New York State Supreme Court on Wednesday alleging that the landmarks panel "acted arbitrarily and abused its discretion."